In continuation from energy saving tips – house wall insulation, in the case of solid walls, insulation is applied to either the inside or the outside surface. 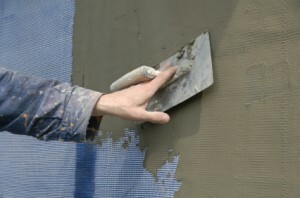 In contrary to the case of cavity walls, where insulation is usually applied by filling the middle gap, insulating a solid wall is considered of primal importance as solid walls consist of a single wall layer; consequently, if poorly insulated, solid walls let through twice as much heat as double-layered cavity walls do. It should be noted that solid wall insulation may cost more than cavity wall insulation but, as a capital investment, is considered to yield more savings on energy losses. Simply put, the energy savings achieved by insulating a solid wall – as energy saving per unit dollar invested – is much higher than the corresponding figure for cavity wall insulation. As already noted in our articles on house wall insulation, wall insulation is applied to maintain heat in winter and keep it outside during the hot summer months; by doing so, the internal temperature of your building remains closer to the desired – comfortable conditions (temperature, humidity, ventilation) thus requiring less energy to achieve internal comfort. Internal or external wall insulation? If you are planning to insulate your solid walls then perhaps you are puzzled between which insulation is best for your case – internal or external insulation? Internal insulation involves fitting insulation boards to the internal surface of the wall or by building an extra layer with insulation material. 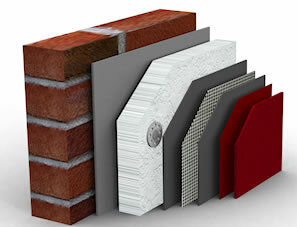 External wall insulation is done by applying the insulating material layer to the external surface of the wall. In this case, the insulting material is exposed to the external environmental conditions, such as direct heat, rain and wind, and, consequently, it requires special additive materials for protection such as plasterwork or cladding. There are many different solutions for external wall insulation and it is highly advisable to take a good study of the specifications provided by different material manufacturers and insulating contractors. In general, apart from the insulation material the external finishing layer can be done up to your liking, such as textured, tiles, smooth etc. but always subject to limitations of previously applied insulation layers. What are the Advantages and disadvantages of solid wall insulation? Depending on the type of materials used, internal wall insulation materials are usually soft and may affect your habits in fixing heavy items on the interior walls. Applying insulation internally means that the thermal capacity of your interior walls is greatly reduced. What this means is that your walls are not charging e.g. heat from your heater because of insulation. Consequently when heater is off the walls have no extra charged heat as thermal capacity to maintain the internal temperature. Essentially, internal wall insulation is usually a trade-off between thermal response and thermal capacity. Unlike internal wall, external wall insulation can be applied without any disruption or hassle to the interior of your house. External insulation, if applied properly, may improve considerable the weatherproof condition of your house – against humidity, moisture, noise etc. Depending on the effectiveness of both materials used and proper application, external insulation and protective layers may increase the life of your house walls by reducing natural wear and tear. In contrary to internal insulation, externally insulated walls exhibit a better behaviour against internal wall condensation and damp. Although external insulation does not reduce the internal living space of floor are as in the case of internal insulation, it may influence your planning permission; to be on the safe side it is advisable that you consult with your local planning authorities before commencing on any solution. The U-value (or 1/λ) is a measure of the rate of energy (heat) passing through your wall in W/m2K (watts per unit meter square Kelvin). A low U-value implies high thermal resistance thus effective insulation; depending on the type of materials used for sold-wall insulation the overall wall U-Value is what counts towards the effectiveness of your wall insulation. Fo any solution that you are planning to install make sure your insulate wall U-value falls within your local building standards. In general a good U-value will fall below 0.50 W/m2K. The thermal capacitance of insulated walls – C-value. Thermal capacitance of a wall structure (C) is a measure of the heat being stored within a wall structure (KJ/oK - kilo joules per deg. Kelvin). As mentioned earlier, thermal capacitance may affect the overall energy performance of your insulated wall and the way you condition your interior climate. 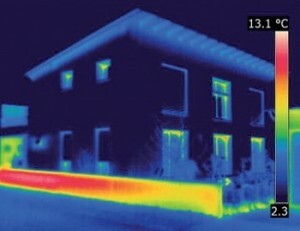 An internally insulated wall with high thermal resistance (minimising thermal flow) and low thermal capacitance (meaning low or no storage ability of heat will have a quicker response to heating up internal space when you turn on the heater but it will not store any heat to provide for once the heater is off. On the other hand a properly insulated wall with high U-value and relatively high thermal capacity (as in the case of thermal bricks) will behave in a different way; It will have a delayed response on turning the heater on as it will first absorb heat before it lets it back for spce heating; moreover, high thermal capacitance will prolong space heating even after the heater is turned off. The concept of thermal resistance and thermal capacitance in solid wall insulation should be carefully considered and is advisable to ask for professional advice before implementing a solution. There is no generic-best solutions to this; best combination is rather the most-appropriate solution as it should be customised to your specific needs taking account of your house construction materials but also – more importantly – your local environmental conditions.